During the 1650's, three European villages had two aspects in common: Not one person died of the bubonic plague epidemic and each village had a perfume factory which utilized lavender oil. While the plague was raging through land, these three villages were mysteriously immune. Exposure to lavender turned out to be the secret. Modern applications of this herb are just as important now as they were in the past. In this day and age of environmental toxicity, superbugs, stress and depletion, lavender oil should be considered an essential element in any herbal medicine chest. As an outstanding immune booster, lavender is an extraordinary remedy for times of travel, illness and infectious disease. Lavender oil has a long illustrious record of healing. Used for pain relief, allergies, burns, headaches, colds and influenza, it's a first-rate, all around natural medicine. Used extensively during the Middle Ages and the Renaissance, lavender oil helped to prevent deadly infectious disease. 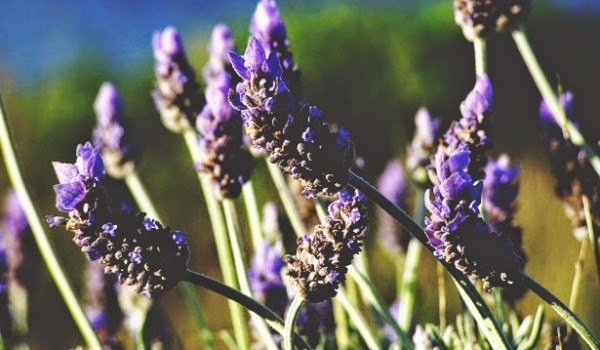 Little did the masses know at the time, lavender "stimulate[s] the production of infection-fighting white blood cells called leukocytes," according to Mountain Rose Herbs. When the essential oil is inhaled, the aroma activates olfactory receptor cells which transmit nerve impulses to the brain. Likewise, tiny droplets are absorbed into the bloodstream via the lungs. Lavender oil is also assimilated through the skin. - Fill a small lidded container with rock salt and two drops of lavender essential oil. During the flight, inhale the scent -- it will keep your nervous system relaxed and the immune system primed. - Bring tea bags filled with lavender herb to enjoy an on the go, immune enhancing beverage. Use 1 1/2 teaspoons per 8 ounces of boiling water. Allow to steep covered for five minutes. - Place a few drops of the essential oil on the soles of the feet. The healing compounds will be absorbed by the skin and circulate throughout the system. In a similar fashion, the oil can be placed on the inside of the wrists. - Spray your seat and tray table with lavender hydrosol to disinfect. It can also be used to refresh the skin. To make your own, combine purified water with 15 drops pure essential oil in a small (3 ounce or less) spray bottle. Shake vigorously before use. - Sprinkle several drops of lavender essential oil on a travel eye mask. At home, lavender oil can be used in a humidifier (10-15 drops) to sanitize the air and boost immune response. The essential oil can be added to bath water as well. A few drops on your pillow at bedtime is a nice way to relax and improve health too. When selecting essential oils, it is important to use a therapeutic grade to avoid fillers and contaminants. Wild lavender essential oil (Lavandula angustifolia) sourced from France is considered the most potent of all varieties due to its high concentration of linalool. In the end, using a high quality lavender essential oil at home or on the road will encourage healthy and serene days ahead. My husband travels a lot so I must share this with him. Great post. Thanks so much. I must stock my medicine cabinet with this jewel. I just tweeted it as well! Excellent! So happy to hear the information is useful. Lavender is such an amazing oil. I had a friend who was constantly ill from colds due to the public nature of her work. She began pinning a small, lavender infused square of fabric on her collar. Guess what? She never picked up a cold from there on out. Great article. Thank you. I keep a 1/4 oz lavender bottle with me at all times, especially when traveling. And thanks Carolanne for your sharing. Wonderful! And you're very welcome. Glad to hear you enjoyed the article and that lavender is such a helpful oil for you.